The first rain began falling on Tuesday night in Mumbai. I was just getting into an open-sided auto rickshaw (which I quickly found out offers very little protection from the rain), as children were running around in the raindrops shouting with joy. The relatively cool breeze that followed the rain was a very welcome relief. Two days later, the second storm hit right at evening rush hour. My half-hour trip home became two and half hours through barely moving traffic and flooded roads. I didn’t see any children shouting with joy. Last night the rains came again. My neighbors reported that water was knee-deep in the road in front of our building. While there was too much water outside, it was the second day in a row with no water in the taps in my building. Flights were delayed (in part by a loose dog on the runway that took an hour to catch, in part by the heavy rain), a portion of the highway near the airport caved in, and traffic again ground to a halt. Plastic tarps are stacked up for sale on street corners, while the old tree next to the snack stand by my office collapsed overnight, altering the whole look of the familiar street. The fire department has trained 120 of its staff to swim in strong currents in preparation for rescuing people in flooded parts of the city. 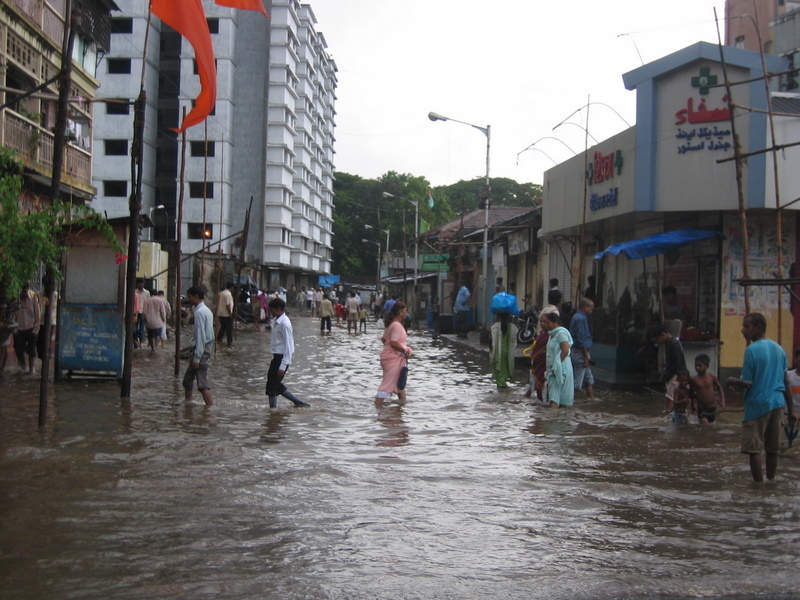 Many of Mumbai’s slums are located in low-lying, flood-prone areas with poor drainage and few to no sewers–they’re in for a particularly long few months as the monsoon rains increase in volume. Dharavi—reputedly Asia’s biggest slum, housing about one million people in a very small area, and located right in the middle of Mumbai. I pass through it everyday on my way to work and have always found the intense activity along the road fascinating. But I had not gone by foot into the slum until today. Wanting to learn more about Dharavi, and at least get more than a glimpse of how it operates, I signed up for a “reality tour” of the area. I had a local guide, and most of the profits from the tour company go to a non-profit that provides training classes for Dharavi residents. Dharavi is far too complex to master in an afternoon, and what I saw in a couple of hours is far too interesting to summarize in one blog entry, so I’ll just describe a couple of the highlights. Dharavi has an annual business turnover north of $600 million and is filled with small businesses and industries. Our tour began with one of them–the recycling section of the slum. Plastic, cardboard, and metal containers are all either recycled or reconditioned by a variety of small workshops. Plastic containers are gathered by rag-pickers throughout the city and sold to middlemen in Dharavi, who sort the plastic by color and grind it down into small pieces. The machines that do the grinding are themselves manufactured in Dharavi—we visited one workshop that made grinders and sold them to recycling businesses just across the narrow alleyway. Talk about a great way to get immediate customer feedback! The small pieces of ground plastic are then sold to other businesses that melt them down. We visited one where bits of blue plastic were poured into a machine that melted them, extruding small streams of blue that looked like wires which then ran through a tub of water that cooled them down. The plastic strings then entered a machine that chopped them into uniform pellets. These pellets are sold to manufacturing plants outside of Dharavi that turn them into new plastic goods. Other recycling processes are much simpler: cardboard boxes are sliced open, turned inside-out, and stapled back together to be sold to local businesses. What looks like a plain brown box on the outside reveals bottled water labels on the inside when opened up. Used metal cans that held cooking oil are cleaned, pounded back into shape with wooden mallets, and returned to the cooking oil manufacturers for reuse. All of this takes place in a series of small workshops along narrow lanes, with the employees often living above their workspace. We then passed through more residential areas of the slum, checking out small garment factories, leather makers, shops, and homes. We concluded the tour in the clay pot-making area, where generations of the same families have been producing pots out of their homes and workshops, burning cotton to fire their kilns. There we met a former guide from the tour company in his family’s home. He had recently graduated from college with a degree in commerce and had just begun a new job with JP Morgan. When we asked what he would be doing there, he replied that he was in training to be an investment banker. He wasn’t sure yet what exactly he would be working on—maybe foreign exchange, maybe derivatives. Here was another interesting example of the changing face of modern India, and a great illustration that the complexity of Dharavi defies many stereotypes of slums. The term “slum” doesn’t come close to capturing all the fascinating individual stories, community ties, and business relationships in a neighborhood that’s been contributing to the life of India’s commercial capital for decades. By the way, the tour company’s policies prohibit clients from taking photos while on the tour, so I don’t have any pictures to post here. However, you can see some interesting photos from a 2007 National Geographic article on Dharavi here (the very first photo shows my route to and from work). Mumbai is a very noisy city. According to one report quoted in the local press, it’s the third-noisiest city in the world. I’ve gotten somewhat accustomed to the noise over time, but then I look at the almost-maxed-out volume level on my IPod when I’m in stuck in traffic and realize exactly how loud the street noise is. Cars honking, trucks rumbling and growling, rickshaws buzzing—all the natural sounds of the city combine for ever-present background noise. Especially the cars honking. So, in what seemed to me a pretty optimistic move, the city declared this past Monday “No Honking Day.” I was out of town most of the day, but when I returned that evening, I was curious to see what impact the day was having. As soon as my rickshaw pulled out of the airport, I could hear the familiar sounds of honking horns over all the other noise. At least they weren’t honking at the airport. I’m happy the city made some effort to reduce the noise for a day, but just reducing honking won’t do much. It won’t stop the road crew from using their jackhammer outside my building at 2am on Saturday night. Or the construction crews just below my window from turning on their deafening generator every morning at 7am—except those few days when they decide to turn it on at 6am. Or the firecrackers at midnight. And what about the thousands of homeless who sleep on sidewalks all over the city? I’m lucky I have a place where at least I can shut a door against the noise. Next time, I think the city should declare “Make Way for Ambulances Day.” Then cars can honk all they want as long as they get out of the way. The only problem is that it’s often hard to hear a siren over all the noise. I think our ambulance sirens aren’t very loud, so I suggested at work that we put more powerful sirens on our vehicles. That way people can hear the ambulances coming much earlier and have more time to pull over, making everyone safer. I was told, though, that the police had already cited our ambulances twice for excessive siren noise. Go figure. I was walking up to the corner near my office when I saw a flash of yellow go by on the main road ahead, accompanied by a siren. It was one of our ambulances—a good sight to see in the heart of Mumbai. Just after it raced by in one direction, a man went galloping by on a white horse in the other direction. He was followed by another man walking down the road with 10 large pipes on his shoulder, transporting them to a building site. There’s a little bit of everything on the roads in Mumbai, and these contrasts are a good reminder that a modern, brightly colored ambulance really stands out on the streets here–especially when it’s moving fast. I don’t have any solid evidence, but I imagine that some people may be hesitant to call an ambulance because they so often see them stuck in traffic with their sirens on, no one pulling to the side to let them go past. How do we help create a culture of making way for ambulances on the roads? Not only would this allow us to provide better service in emergencies—from a marketing perspective, it will also help people associate ambulances with speed and make them more likely to use one in an emergency. When I walk through the gate of my newly-constructed apartment building in Mumbai, I first have to walk around a dead tree. Someone took the time to pave around—rather than cut down—the 10-foot-high tree stump that stands right in the middle of the main entrance. 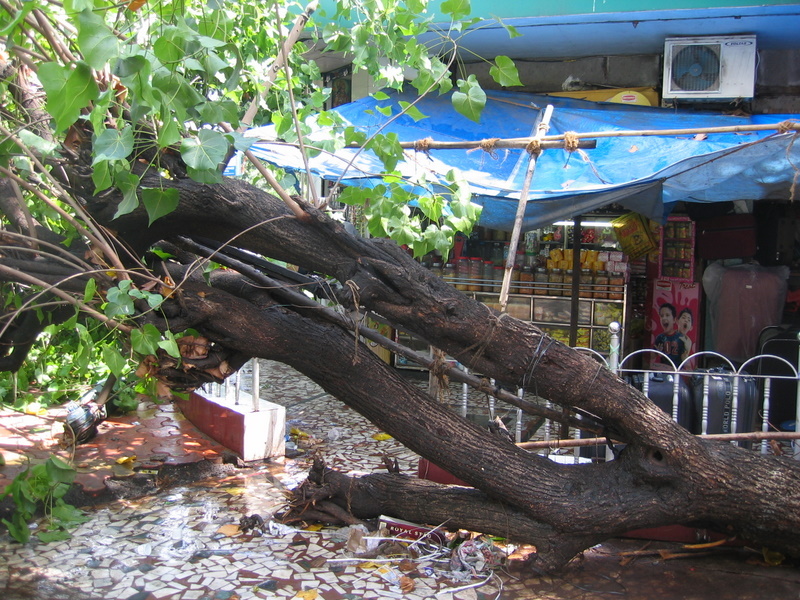 Because of the tree’s position, only narrow vehicles have access to the building. What would happen to an ambulance? Unfortunately, this design flaw (or common sense flaw) is not confined to where I live. This past weekend saw the running of the Mumbai Marathon, and the 1298 ambulance service provided ambulances for the race. In the lead-up to the marathon, a 4-day “Health and Lifestyle Expo” took place at Mumbai’s World Trade Center. The ambulance service shared a booth with the race’s medical sponsor, so I went to the Expo on the first day to help ensure that everything was set up for our marketing efforts. As part of our presence at the Expo, we had one of our ambulances parked outside. The problem was that the ambulance was in danger of remaining outside of the complex. The entry to the parking lot in front of the conference hall is blocked by a metal security arm that pivots up and down. Unfortunately, it does not lift up high enough to allow an ambulance to pass underneath. After a lot of discussion and negotiation, we convinced the parking lot attendant to allow us to drive the ambulance in through the exit, where the security bar lifted higher up. If there were a real emergency at the conference hall, the time lost in getting an ambulance inside could have serious consequences. And if there were a fire, well…. High quality ambulances can and do go a long way in ensuring that lives are saved in emergencies. But other steps need to be taken to ensure that even more lives are saved. Small design modifications could make a huge difference here. Cutting down that tree or building a security arm that lifts higher does not take a lot of money or technology—just some foresight and attention to design. My colleague told me to get ready for some rugby. He wasn’t kidding. We were returning to our office from a promotional event and the commuter train was the fastest way back. It was early afternoon and rush hour was still a few hours away, so we decided to go in the second class car of the commuter train—tickets in the first class section are ten times more expensive and, at that hour, the train should not have been too crowded. When the train pulled up with passengers almost bursting out the wide openings in the sides of the cars (there are no doors), people on the platform started running, pushing, and shouting to get on. I was practically carried in by the force of the crowd. So much for the train not being too crowded. And that was the easy part of the trip. After standing in a packed compartment as we headed south through Mumbai, we started positioning ourselves to exit about two stops before our destination. At the stop before, there was a big surge of people onto the train and I was almost lifted off my feet. I was pressed in from all sides, and I couldn’t move an inch. There was no need to hold onto anything—there was no way I could fall over. As the train pulled up to our stop, the passengers around me started shouting as they surged out of the train. Actually, it was more like a stampede as people pushed, hit, and shoved. After a couple of elbow shots to my head, I was propelled out the open door and found breathing room on the platform. No broken bones, my wallet was still in my pocket, and my colleague was safe. He said we were lucky to have made it onto the train. At rush hour, he has to wait for three or four trains to pass before he can force his way onto one. This is the way most people travel to work here every day of the week. As my colleague said, it’s inhuman. And unsafe. Almost 4,000 people die each year on Mumbai’s commuter trains. That’s over ten people a day. The death of one passenger on a subway makes headlines elsewhere. Here, it’s just another number in a criminally high statistic of reported deaths (I have yet to see statistics on those who are critically injured on the trains). An ambulance service can save some of those lives—but it’s up to the railway authority to do much more to prevent them. As the world’s cheapest car was rolled out in India this week, it’s hard not to wonder what the money and ingenuity that went into developing the car could have accomplished had they been spent on improving public transportation here. Maybe save 4,000 lives a year? I’ve been reading “Maximum City,” by Suketu Mehta, an account of modern Mumbai (aka Bombay) written in 2004. It came highly recommended, and it’s been an excellent read so far. Mehta goes on to elaborate on the population density here: “Singapore has a density of 2,535 people per square mile; Berlin, the most crowded European city, has 1,130 people per square mile. The island city of Bombay in 1990 had a density of 17,550 people per square mile. Some parts of central Bombay have a population density of 1 million people per square mile. This is the highest number of individuals massed together at any spot in the world.” (p. 16) I now find myself one of the 14 million densely packed people here—a humbling feeling. Everywhere I turn there are people and cars and rickshaws. It’s dangerous to stop while walking in many places—invariably someone will bump into me when I do so, and I bump into someone else if I turn without looking in all directions first. Moving around here brings to mind a former US ambassador’s description of India as a “functioning anarchy.” There are cars moving in every conceivable direction without regard to any traffic rules, but they get where they’re going and people seem to work with the flow. I just wonder what will happen as India’s economy continues to grow and the expanding middle class continues to aspire to owning a car. In the U.S., the rate of car ownership is almost 500 vehicles per 1,000 people. By my rough calculations, if the people living in that square mile of central Bombay with a population density of 1 million had the same rate of car ownership as the U.S., their square mile would be entirely paved in cars parked bumper to bumper, with a few cars stacked on top of each other. Of course the people who live in that square mile are likely to move out before they purchase a car. But the rising rates of car ownership on crumbling Mumbai roads that are already packed with vehicles is something to think about. If you’re an office worker in Mumbai and you crave fresh, home-cooked food for lunch, you need only call a dabbawala. These workers pick up, transport, and deliver lunches from home to office using a complex but incredibly accurate system. Mumbai’s dabbawalas have received a lot of attention (for instance, see this recent article in the New York Times), and justifiably so—their ability to deliver lunches on time around a city filled with traffic while making almost no mistakes is an incredible story. A business school case study has even been written about their service. This week, the Hindustan Times ran a front-page article on financial institutions that are using dabbawalas and postal carriers to reach people who don’t have ready access to banking services. The banks are taking advantage of the daily contact these workers have with residents around Mumbai, and are even employing technologies such as electronic passbooks and hand-held devices that recognize customers’ thumbprints. This is a great example of businesses innovating to find ways to reach the poor with valuable services. The dabbawalas’ own website, http://www.mydabbawala.com/, includes examples of how other businesses such as cell phone service providers are using the dabbawala logistical network in Mumbai to reach new customers.